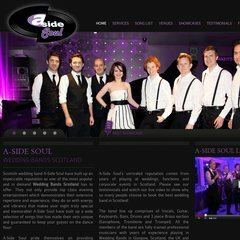 Topics: Services, Song List, Venues, Showcases, Faq's, and Edinburgh. The site has about 187 users daily, viewing on average 5.60 pages each. It is hosted by Atls-lb (England, Leeds,) using Apache web server. Its IP Number is 94.136.40.103. ns2.123-reg.co.uk, and ns.123-reg.co.uk are its DNS Nameservers.